Aroma Life essential oil improves your cardiovascular, lymphatic and your circulatory systems. An energizing blend of Cypress, Marjoram, Helichrysum and Ylang-Ylang, which brings vitality to your heart. Your blood pressure will be lowered and this essential oil also helps in the reduction of stress. This oil blend was formulated after years of research for both physical and emotional health. For me the using of essential oils to complement your medication does work. I use Aroma Life Essential Oil as complementary to my medication for years and the surprising side benefits I have derived from it is my cholesterol was also lowered and also my blood pressure medication dosage was lowered. For this I am thankful because I do not have to take any statins drugs. First you should know what are essential oils, how to use them, and when you first start using these oils how to apply to the bottom of your feet. This allows your body to become acclimated to the oil, which minimizes the chance of any reaction. If you experience a reaction after applying essential oil, you should temporarily discontinue using and start an internal cleansing program before resuming regular use. Also increase your water intake while using these oils. Helichrysum used for the improvement of circulation and reduces blood viscosity. It is anticoagulant, helps in the regulation of cholesterol, stimulates liver cell function, and reduces plaque deposits from the veins and arteries. Ylang Ylang used to balance heart function, treat rapid heart beat, high blood pressure and combat insomnia. Marjoram helps to regenerate smooth muscle tissue, assist in relieving muscle spasms, calms nervous tension and has a diuretic like action. Cypress improves your circulation and lymphatic drainage. Reduces edema and water retention while strengthening your vascular system. Carrier Oil is Organic Sesame Seed. Apply topically 4 drops on the inside of both your wrist in the morning. Apply another 4 drops to the inside of your elbows midday. Apply to the back of each ear at night. You may also apply to your foot bottom, massaging in the oils. 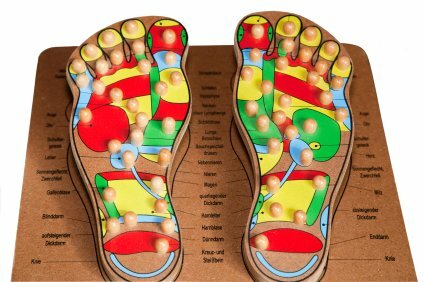 Here is a Vita Flex Foot charts that correspond to the organs of your body. Oils can be applied over your heart and abdomen in conjunction with Raindrop Technique. For a full body massage dilute 1:15 of Aroma Life with vegetable oil and mix in a container made of glass or earthenware, rather than plastic. Plastic particles can leach into the oil and then into your skin once applied. Purchase today and start using essential oils to lower your high blood pressure now.